How To Become a Certified Google AdSense Partner? How many of you use Google AdSense as one of the, if not the only, monetization solutions for your site? I think I'm getting an overwhelming nod of affirmation. The fact is, Google AdSense has been the choice of almost every blogger and website owner at least once during the course of their online venture. And countless consultants and service providers have sprung up who have built their businesses with AdSense, and now help publishers succeed with AdSense. To help such successful service providers and publishers and to recognize their AdSense expertise, Google has launched the Google AdSense Certified Partner Program! Certified AdSense Partners are qualified professionals who are certified by Google to offer help and services to other AdSense publishers regarding their businesses. These partners have to meet rigorous qualification requirements, and are carefully selected by Google. At the time of this writing, as many as 13 professionals have been certified since the launch of this program, and more are going to be certified in the coming weeks. 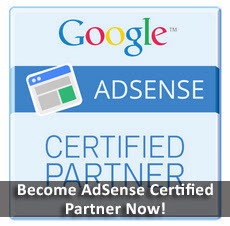 AdSense Certified Partners set up, optimize and maintain AdSense accounts for their clients. They're required to demonstrate product knowledge by completing a certification examination, and their purpose is to help website owners to monetize content effectively with Google AdSense. Be able to establish a relationship with the Google AdSense team and receive insights into the latest features. The requirements for this program are tough, but the benefits are manifold. You can view the full list of requirements here, and you must follow all of them in order to get access to the AdSense Certified Program. If you’re a prospective Certified Partner or a publisher interested in the services offered by these Certified Partners, you can visit the program website or Google Help Center for more information. This is an awesome post and I fall into the needing help category!!! I'm going over and checking out how to sign up! Thanks for providing this information. I'm really glad that I came across your site!